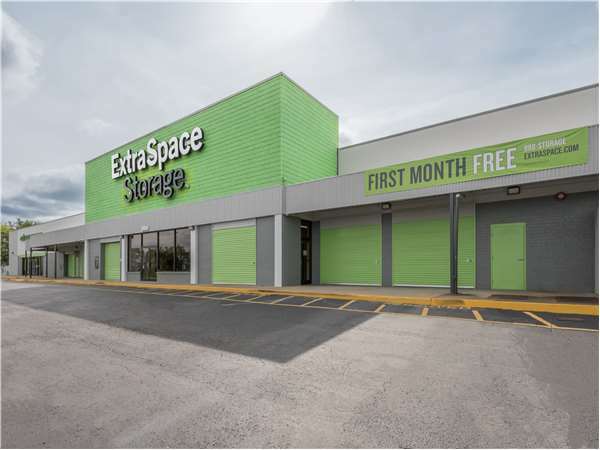 Located on Charlotte Ave. west of White Bridge Pike and south of I-40, Extra Space Storage serves Nashville residents near Sylvan Park, Hillwood, Urbandale Nations, and Hadley Park. Locals will recognize our facility near K&S World Market, Lucky Bamboo China Bistro, and Miss Saigon a few minutes from Kroger and Charlotte Heights Church of Christ. We're also accessible for residents of nearby apartments, such as Western Hills Apartments, Park West at Hillwood, Richland Hills Apartments, Richland Creek Apartments, West End Terrace, and Croley Court Apartments. Extra Space Storage is about 3.2 miles from John C. Tune Airport, so we're a great option for Nashville residents who need storage units or vehicle storage close to the airport! Are you a college student in Nashville who needs a storage unit over the summer or while studying abroad? Our Charlotte Pike location is about 3.8 miles from Tennessee State University, 3.9 miles from Fisk University, and 4.5 miles Vanderbilt University, so we're an accessible solution! With a wide range of storage unit sizes, climate-controlled storage, vehicle storage, and exceptional security, Extra Space Storage on Charlotte Pike is the solution you're looking for in Nashville! With storage units ranging in size from 5x5 to 20x25, our Nashville storage facility has the space to handle what you need to store. Unit features include climate control, drive-up access, and more! Our Charlotte Pike storage facility provides the safety and peace of mind customers want by utilizing advanced security measures like an on-site resident manager, individually-alarmed units, 24-hour video surveillance, and electronic gate access. Climate control keeps units between 55 and 80° year-round and is a great option for anyone who plans to store temperature-sensitive items. Climate-controlled units are available in sizes 5x5 to 20x25. Need to store a car, motorcycle, boat, or RV in Nashville? Extra Space Storage has 5x10 to 10x10 drive-up units and 10x20 outdoor parking spaces that can handle vehicles of all sizes. At Extra Space Storage, we've made it our mission to provide reliable, high-quality storage. From our clean, secure, well-maintained facility to our friendly, professional staff, you know you're getting the best service when you rent with us! Contact us today to reserve a storage unit in Nashville! I'm impressed with the cleanliness, security, size availability as well as customer service and ease of access. Excellent customer service. Answered all my questions and helped me find the storage that fitted my needs immediately. Ms Patrica who is the MGR at Extra Space Storage is the place You want to store your belongings,she very professional and friendly and always willing to help with any problem that may occur.I have had zero problems. Great customer service. You’re not them begging to rent a unit. They are the ones being paid for space and they treat you as such. Rare! I was not treated the same at other facilities in West Nashville. I am renting two units from Extra Space, and both times the staff has been incredibly helpful to find a unit in my price range that would fit what I have. The space is incredibly clean, and the staff serve well. Thank you to all! After downsizing from a large home to a townhouse half the size, I realized I couldn't dispose of enough of my life and needed climate controlled, pest free and secure storage. ExtraSpace Storage was the answer to my prayers! Friendly customer service, great security, and clean, pest free units. Truly one of the best customer experiences I have had in the last 10 years. All around an amazing group of people. The facility is IMMACULATE and the staff is wonderful...very helpful and accommodating every step of the way. I recommend this facility to anyone in need of self-storage. We have used Extra Space on Charlotte Ave in Nashville several times over many years. I even chose it over one closer to my new home because the units are clean and easy to get to and the service people there are wonderful. I recently finally got to move all of my stuff out of there and they congratulated me, and made it really easy. Super kind, thanks guys. This is a well managed facility, safe, clean and secure. Patricia, the manager is always so friendly and helpful. This is an excellent choice for storage. Excellent service. Very clean. Always in great condition. Would recommend this to anyone. With a friendly, knowledgeable staff that was willing to help me with all of my needs, I would definitely recommend this facility to others. The prices are in the ballpark and they run a clean, secure place. First Class operation. Clean. Easy Access. Fast. Accurate. Informed. Knowledgeable Personal. The entire experience under the circumstances I found myself experiencing were incredible handled by personnel who made me feel like if I was the only client looking for extra storage. Their quickness in finding even a storage fit for my needs were amazing. This storage facility is hands down the best I've found in the area if not the city of Nashville. It is so clean and the manager Patricia is SO nice and SO helpful and you can tell she takes pride in the facility. no room access at night, otherwise perfect. 24 hour access would be convenient. This review is overdue, I came in in March and needed a unit, Patricia the store manager was incredible. Her customer service was above anything I've ever experienced. She was genuine and funny and made a stressful situation a delight. What a wonderful woman, I wish there were more people like her out there! She was easy to work with and professional. She explained everything clearly and made my experience easy and nice. Thank you Patricia! the manager on site was Pat and she was excellent, very helpful!!!! The manager, Patricia, was so helpful to me. Her custormer service is phenomenal! She makes you feel very comfortable and secured storing your things at Extra Space! I had a 10' x 15' unit that I packed to the max and stayed way longer then anticipated. This facility is always spotless. I've even seen them cleaning up the parking lot around the building. If I noticed some kind of issue it was repaired promptly. Phil and Patricia were great. They were always eager to help out with any questions I had. They also take security seriously. One day when I was in the office someone tried to take a shortcut into the facility through the unlocked office door. Patricia stopped him and made him go around to the outside door and use his code. You're in good hands at the Extra Space Storage on Charlotte. I have been blown away by the service this team provides. This is a professionally run storage facility. It is CLEAN, SECURE, FRIENDLY, HELPFUL. I like the fact there are cameras and you must enter a code to access the facility. The units are alarmed and the majority of the units are climate controlled. If you care about what you are storing and want it kept safe and clean this is the place. It is not creepy like some storage facilities. I feel safe on the premises. Definitely recommend! Extra Space Storage is a great place to store. It's clean and secure. Patricia and the rest of the staff are very friendly and helpful. Patricia was an amazing help. I literally called and was moved in an hour. She was very accommodating and friendly. The facility is easy to find and access. The units themselves are very clean. Patricia is absolutely fantastic. Other than location, she's the reason I have rented space at Extra Space Storage on Charlotte Pike in Nashville. I checked out one other storage place and they didn't come close to the service and friendliness I got at your location. Thank you for being there for us. Great place and wonderful customer service. Patricia is GREAT! The facility is very clean, convenient, and has good hours of operation. The staff is always very friendly and helpful. Very pleased as a customer so far. Well priced and convenient. Staff very pleasant. I am pleased with this storage facility. Employees are nice and helpful....very accomodating when I needed to move to another size storage bin. I like the secure entry....keypad used to get inside. I feel safe and secure when there and do not worry about harm to "stuff" in storage. I recommend this facility to anyone. This is one of the nicest storage places I've seen. Very clean and easily accessable. Didn't take much to convince me to store my things here. I love that it's all inside so I don't worry about changes in the weather affecting my stuff. Great place and highly recommend. While I was initially quite pleased with ESS (lower costs compared to nearby facilities, clean, etc. ), I am now disappointed. I received a notice today stating that my costs will be increasing...again. This is the second time my rate has gone up in one year. I am now paying 20% more compared to when I started. I am planning to move out. Overall ESS is a good organization. The facility is clean as well as safe. Sick and tired of not being able to find carts because you are too cheap to buy more, finding broken garage doors open for an entire weekend, but no added security as a result, finding cars and trucks parked in front of garage. All of this and rent goes up constantly despite my being told when I rented this space that rent had never been increased. When I complaint, I get no where because they have no control. From I-65 South merge onto I-40 West. Then take exit 204B (White Bridge exit) Turn Left at the end of the exit ramp onto White Bridge Rd. Then make a right at the second light onto Charlotte Pike. We are on the left about a half mile from the intersection of Charlotte Pike and White Bridge. From I-65 North merge onto I-440 West and follow it to I-40 West. Then take Exit 204B (White Bridge exit) Turn left at the end of the exit ramp onto White Bridge Rd. Then make a right at the second light on to Charlotte Pike. We are on the left about a half mile from the intersection of Charlotte Pike and White Bridge. Take I-40 West. Take Exit 204B. Turn left onto overpass or exit 204 of I40-E. Right turn onto overpass. Come down to Charlotte Pike and turn right at Walgreens. Follow Charlotte Pike West about two blocks and turn left up the hill by K&S Market. Take I-40 East. Then take Exit 204 (White Bridge exit) Turn Right at the end of the exit ramp onto White Bridge Rd. Then make a right at the second light onto Charlotte Pike. We are on the left about a half mile from the intersection of Charlotte Pike and White Bridge.